Fine Art Shippers has long been shipping fine art and antiques for auction buyers and sellers. Moreover, we are very proud to collaborate with many reputable auction houses based in the United States and abroad. In particular, we work with Leslie Hindman Auctioneers, Jackson’s International Auctioneers and Appraisers, McLaren Auction Services, Nye & Company, Clarke Auction Gallery, Bruun Rasmussen, iGavel Auctions, and Roland Auctions NY. 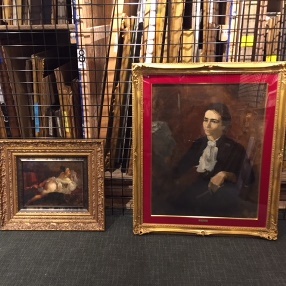 Besides, as one of the best art shipping companies in the country, we also frequently pick up various art pieces and antiques from Sotheby’s, Christie’s, Phillips, Bonhams, and Doyle auction houses to deliver them to our clients from around the world. Plus, did you know that Fine Art Shippers is also a preferred local shipping company for Shapiro Auctions? We have been working with this New York’s premier auction house for many years, and we are very proud to be the top-rated art shipper on their list! Fine Art Shippers is headquartered in New York City, so it is no wonder that when it comes to the best local shipping company to pick up artwork from Shapiro Auctions, we are the number one choice. We operate all over the Tri-State Area and can deliver your art even within a single day if necessary. Overall, no job is too big or too complicated for Fine Art Shippers, making our local shipping company an ideal option for even the most challenging and urgent orders. Moreover, in addition to our auction pick-up and art courier services, we also offer art installation, art storage, art insurance, and many other art-related services to meet our clients’ any needs. It is also worth noting that while Fine Art Shippers is the top-rated local shipping company for Shapiro Auctions, we actually operate all over the world thanks to our representative offices and agents in Great Britain, France, Germany, Russia, China, India, Australia, and other countries. Moreover, as part of a large logistics company, Fine Art Shippers has all the resources and licenses to organize international shipments, consolidate freight, do direct bookings, handle all the customs documentation, and more. We can deliver your art to absolutely any destination safely, securely, and on time! What is no less important, our local shipping company offers some of the lowest rates in the New York metropolitan area. You can check this out by simply requesting a free shipping quote right from this website!